The breathtaking follow-up novel to the award-winning Half World. Emptiness was good. Emptiness meant there was nothing inside that would break and shatter. The rage that had burst from his hidden place -- it was gone. And what was left, Gee thought numbly. Darkness unfurled in Gee's gut and he grew very still. He breathed carefully. Slowly. He did not want to become angry. 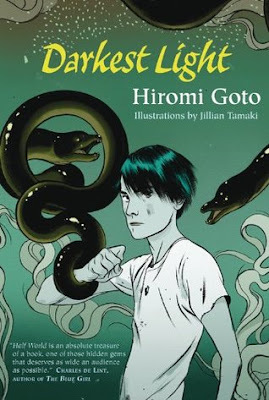 Packed with vivid painterly settings and strange beings, Darkest Light by Hiromi Goto is a breath-taking companion novel to Half World. As much as I enjoyed Half World, with its fantastic world building, great lead protagonist, and absolutely fascinating mythological backdrop, I loved Darkest Light EVEN MORE. Hiromi Goto is an exceptional storyteller. She literally floods the pages of her book with gorgeously imagined scenes, characters and places. Think you're too old or too hip for an action-packed, anime-like tale of one boy's journey to discover himself and his place in the world? Get over it! Set 16 years after the events of Half World, Darkest Light tells the story of Gee, a re-born antagonist from Hiromi's previous novel. Brought to the Realm of Flesh as a newborn baby by Melanie (the lead protagonist in Half World), Gee grew up in a loving home with his adopted grandma, Popo (who you may remember as Ms.Wei). Despite all the love and affection he gets from his popo, Gee doesn't feel like he belongs in this world. He's lonely. Kids at school resent him and laugh at him, his older sister moved away to attend a graduate school across the country, and his grandma isn't much of a companion - she doesn't want to talk about Gee's past and his origins. He knows that something bad happened many years ago, but every time he asks his grams about it, she makes excuses to avoid giving him any answers. All she tells him is that he must never get into any trouble with the law. And so Gee tries his best to be good. But there's a small, dark and silent place deep inside him, a seed that needs to be contained at all costs, a voice that keeps on telling him to let go and stop pretending he's a good little boy. That he can do anything he wants. And the voice is growing in strength with every passing day. The Half World is calling to him, compelling him to leave everything and return to the Realm that was once his kingdom. 16 years ago, thanks to Melanie's bravery, the Three Realms have been reunited, restoring the balance to the sacred cycle of life and death. Now, the balance is at risk again, and it's up to Gee and the choice's he'll make to either break the connection between the Three Realms, bringing about chaos and despair, or strengthen the link, ensuring harmony and peace. With two extraordinary side-kicks, an arrogant white cat and a badass Neo Goth chick, Gee will embark on a journey into the Half World. A journey of self-discovery and redemption that will decide the fate of the entire world. Visually mind-blowing, thematically ambitious, thought-provoking, moving and extremely fun to read - Darkest Light is all that and more! I can't stress enough how much I adored it. It's so rich in flavor, so astonishing in its imagery and brilliant in its creativity - it's impossible not to fall in love with it. Many books out there are billed as unique voyages into fantasy, but this one truly delivers. It has the psychological and emotional depth to match its excellent visual performance and stunning eerie atmosphere - and that is extremely rare. Choosing to write a companion novel about Half World's antagonist was a truly slum-dunk move on Hiromi's part. Gee's character was a very complex one, his struggles, hopes and fears - very convincing, real and just so... human. Hiromi showed us that there is no evil in this world that's beyond redemption, no villains that can't be saved with just a little bit of effort, love and faith. All in all, Darkest Light is a beautifully told epic adventure of smashing power, sensitive characterizations, and rare depth. It's a journey in both literal and metaphorical sense, and every fan of fantasy, horror and adventure ought to take it. Wow!! These sound like books I need to read. They sound like they are very descriptive and are stories you can totally get lost in. Fantastic review!! Jeez why haven't I seen this book before!? It sounds really need and adventurous. I'll def. keep an eye out for it. Awesome review Evie! It seems I must read. Such a rave review. A second book that surpasses book one? This is rare and to be commended! Love the book trailer! I believe it is the best one I have seen so far! I am SUPER happy that you love this! I rarely find a book that the second one surpassed the first! AWESOME! Nice review! I'm seriously thinking about getting this book and the one that comes before it too. Sounds awesome and I love the cover. Never heard of this book before! Sounds like a really interesting read!